With responsibility for hundreds of lives at a time, it's no wonder being exact and accurate are essential qualities for pilots. They fly passenger-carrying airplanes on a fixed schedule. They do pre-flight checks following a prescribed list that included making sure the aircraft is balanced and has an adequate fuel supply. 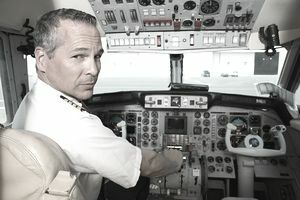 Pilots also diligently monitor fuel consumption during flights. Whether they are in charge of movies, television or stage shows, commercials, or news broadcasts, directors must see to it that everything that takes place during the productions runs smoothly. They select scripts or choose news stories, hire talent, and oversee the work of entire casts and crews. Accountants prepare financial statements and explain their findings to their employers and clients. If this information is inaccurate, it can cause many problems. When accountants prepare these official documents, they go to great lengths to make sure to adhere to Federal and state laws and follow procedures to keep that from happening. Laboratory technologists examine specimens under microscopes, counting cells and looking for abnormalities. They also type and cross match blood samples for transfusions and analyze the effectiveness of medical treatments. Doctors and other healthcare professionals rely on laboratory technologists to help them detect, diagnose, and treat diseases. Court reporters transcribe the proceedings of trials, hearings, and legislative meetings. They put spoken words, including oral testimonies, rulings, and remarks, into written form. Court reporters must provide complete and accurate records of these events and also have to include the correct names of every participant. Taking the incorrect amount of a drug can cause serious health problems. Pharmacists, therefore, have to be extremely precise when dispensing medication doctors have prescribed for their patients. In addition to filling prescriptions, they also advise physicians and other medical practitioners on the selection, dosages, interactions, and side effects of drugs. Editors' responsibilities all revolve around one goal: making sure the articles, books, magazines, or journals they produce are enjoyed by the consumers who purchase them and, in the case of non-fiction materials, are accurate. They begin by choosing the content they think will appeal to readers. Then editors review material and suggest strategies to improve it and, finally, make sure the finished products are error-free. Veterinary technicians assist veterinarians in providing medical care to animals. They record information about an animal's food intake, weight, and vital signs. They draw blood and perform other diagnostic tests. Vet techs, as they are often called, also administer medication and other treatments. All these tasks require strict attention to detail. Translators and interpreters convert written and spoken information from one language to another. They must take great care to be accurate. Using the wrong word or words can change the meaning of what was originally said or written. In many cases, this can cause serious harm. After analyzing their clients' specific needs, insurance agents help them choose suitable insurance policies. They maintain records, renew policies, and help customers settle claims when losses occur. Insurance agents also suggest changes to current policies as needed. It is essential to keep accurate and up-to-date information about their clients and the products they recommend to them. Computer programmers write code that allows software applications and operating systems to perform as software developers and engineers intended. They must then debug that code by looking for and removing errors. Still, at this point, most applications aren't perfect, and programmers continue to work on them until they are as close to that as possible.